Navid Naderi writes derivative poems and studies literature. He has worked on the history of philology in the 19th century, and contemporary American and Iranian poetry. 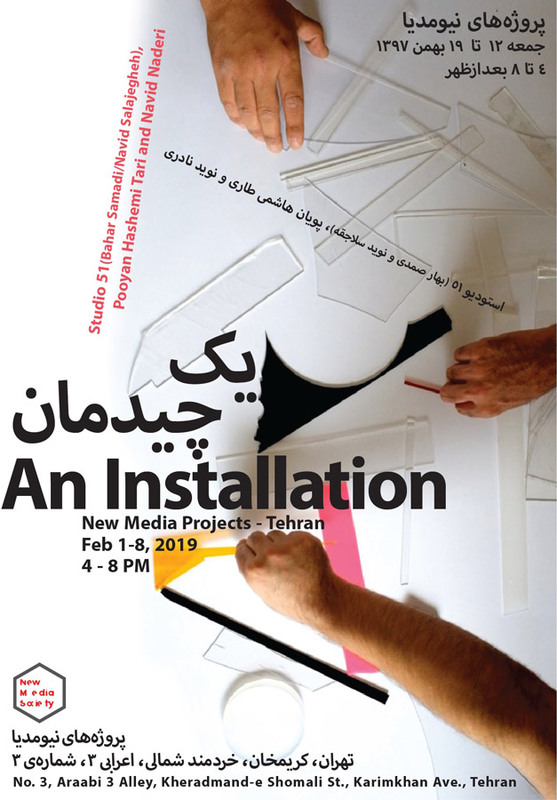 Studio 51 is a collaborative project of Bahar Samadi and Navid Salajegheh since 2014. Their work consists of constructing a series of micronarratives and assemblages which reappear in a here and now that is alternative to the primary time and space of the used material. They recycle and re-employ pre-existing footages and other visual and textual materials, processing them through diverse media, spanning from moving images to performance, installation, and painting. The outputs of these projects are visual, auditory or tactile experiments which create new relations between content and expression of materials. Studio 51 also functions as a laboratory for these two artists to discover new forms for the possibilities of “working together” and, ultimately, to observe the way they evolve from one project to another. Pooyan Hashemi Tari has been engaged with various mediums such as painting, sculpture, installation, video art and performance. His works are ‘self-processes’ aiming to evoke questions in order to reexamine our understanding of the ‘self’. He considers this process to be successful if it could preserve the complexity of the very general yet ambiguous question of ‘who I am.’ Central to the idea of self-process is the interrogation, and perhaps even transformation, of the innate or acquired thresholds, which, unbeknownst to us, have already formed the internal and external boundaries of our conception of the self.